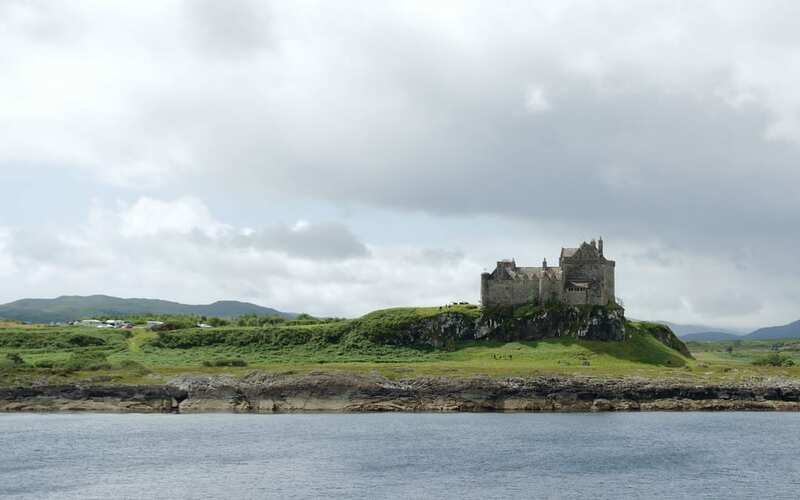 Mull has a number of castles so why is Duart Castle worth a visit? First of all it looks impressive sitting up on the clifftop at the end of a penninsula as though guarding Mull. Then there’s the history of the Clan Maclean and the story of how it was restored in 1911 after being abandoned since 1751, the fact that is has 800 years of history, the fact that it is privately owned. Maybe it’s to see the Edwardian State Rooms, the magnificent Banqueting Hall, the 13th Century Keep or the Dungeons. Perhaps it’s to go up onto the roof and gaze in awe over the Sound of Mull. Then of course it could be that you saw it while watch the film ‘Entrapment’ with Sean Connery and Catherine Zeta Jones or in the film ‘When Eight Bells Toll’ with Antony Hopkin. All good reasons for a visit but to top it all Duart Castle also hosts events so why not combine your trip to the Castle with one of its events such as Military re-enactments, Highland Dancing, Music and Theatre.